Published on May 19, 2008 in Events, Fun and General. 3 Comments Tags: Flipping websites for profit, Marc Dussault, MindMap, Paul Telling, Unlimited Power. This past weekend, I was in Melbourne for the Unlimited Power event (see previous post) and there was this guy in the audience named Paul Telling who was taking notes, well in fact he was MindMapping. After my presentation, I got to chatting with him and noticed his MindMap. It’s an incredibly creative example of an Exponential Mind in ACTION. We’ve been teaching MindMapping to our VIP Platinum Members for years, in fact I’ve written a chapter in a recently published MindMapping books for Teachers and Business People, and have had not one, but two case studies published on MindMaps but that’s a discussion for another day. Paul’s MindMap was so cool that I asked him if he’d give it to me as a GIFT to you. 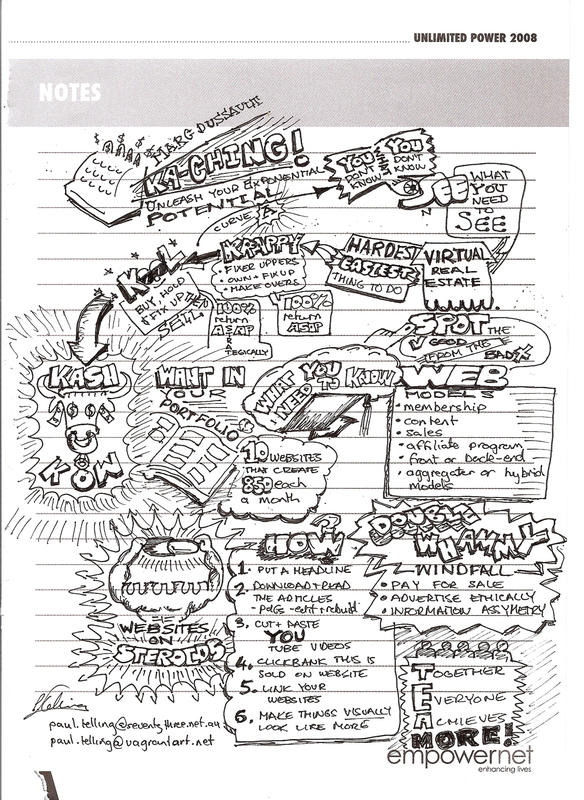 So here it is, the MindMap of my “Flipping Websites For Profit” presentation (click on the image to see it full size and download it). You can thank Paul by posting a comment here or visiting him at the address on the MindMap – I don’t want to post his e-mail since the SPAM spyders will pick it up! I hope you enjoy this unique and creative gift, it’s my gift to you from Paul Telling MindMapper Extraordinaire! If you’re based in Sydney, I am giving this presentation at the Sydney Masonic Centre this weekend – see the previous post or click here to attend. The reason I am telling you this is so you can do the same for your clients, suspects and prospects. If you come across stuff that is this cool, please send it to me – I love stuff like this!